DR DEE: ALASKA VET is back on Animal Planet with an all new series premiering this September. 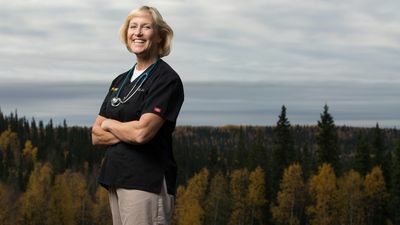 As one of the most successful veterinarians in Alaska, it is not uncommon for Dr. Dee Thornell’s daily patient roster to include reindeer, moose, ducks, bears and pigs. Dr Dee is committed to and loves her job, going the extra mile to reach the most vulnerable of animals – she managed to secure a pilot’s license and learnt to fly a plane so she can reach all of her clients, even the ones that aren’t able to make it to her clinic in the furthest areas of the state. Now she and her husband travel the country offering veterinary care, as well as spay and neutering clinics, in remote villages. Knowing that no animal is off limits, Dr. Dee and her staff handle extreme cases with care and compassion, from caring for a dog apparently suffering from a gunshot wound, to working on a pot-bellied pig in surgery, to helping a friend’s stallion who is suffering with a potentially deadly tumor.